Many big box medical clinics have high overhead due to their high number of salaried & contracted full-time & part-time administrators. 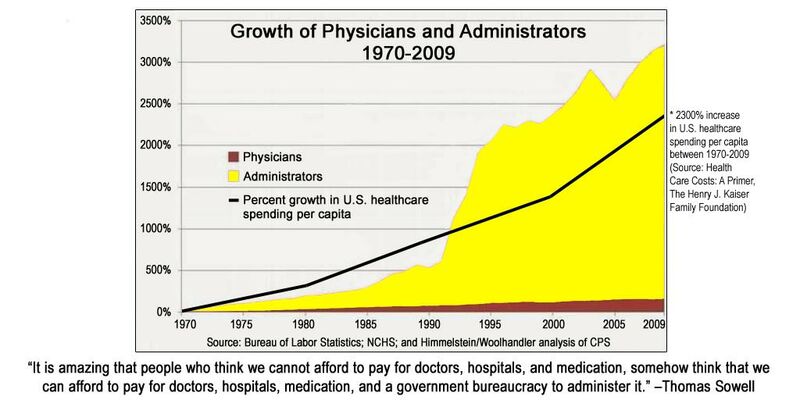 Take a look at the appalling graph below on the growth of administrators vs. physicians over 40 years. See how the growth of administrators is associated with huge increases in healthcare spending and increased cost to you the patient. Direct Primary Care (DPC) clinics are the opposite of big box medical clinics. DPC clinics keep patient costs down by limiting high overhead and the number of administrators. Most Direct Primary Care (DPC) clinics only have one administrator and they pass the cost savings to their patients. ​Do you want to keep your primary care and healthcare costs down? If so, see the Direct Primary Care (DPC) mapper here to find a DPC clinic near you. Do you want to create demand for more Direct Primary Care clinics in our country? If so, prove the demand here. ​When you have an acute medical need like sudden cold or flu symptoms, piercing back pain, or even a weird rash, who should you call first? The answer for many healthcare issues is to call a family physician. The exception to this is, of course, medical emergencies. Medical emergencies require an immediate visit to the emergency room. The problem with this is that the emergency room or urgent care center is the primary source of care for many people. In fact, this is one reason why we as a country spend more on healthcare than anyone else, and why we rank far below the top in overall health. Finding and using a family medicine doctor for you and your family can help this situation. Continue reading for the benefits of having a family physician. Family medicine physicians can treat infants, toddlers, children, teenagers and adults. It is not uncommon for a family medicine doctor to see their patients for decades of their lives. Since these physicians have the skills to treat a wide range of medical conditions, they can be your primary care doctor at any point in your life. This helps you build a great relationship with your physician that will last a lifetime. When a doctor is able to treat you for years of your life, they develop a keen understanding of you and your medical history. This helps your doctor to make accurate diagnoses and monitor you more closely for any changes or red flags in your health screenings. In addition to keeping track of your medical history, a family doctor can understand what is happening in their patients’ home lives. For example, if a child’s parent just lost their job, the physician can accurately assess the child’s stress and anxiety. While family medicine doctors perform your yearly check-ups, they also are there to help you navigate chronic medical issues such as diabetes, heart disease, asthma and arthritis. They can also treat your acute medical conditions like injuries and many infections, help you through stressful times and keep you well throughout. Sometimes issues arise that require consultation with or care from a specialist. These can include serious issues like heart disease and cancer. When you or someone in your family develops one of these conditions, your family physician can find someone who fits your exact needs and personality. It should come as no surprise that using more primary care doctors, including family doctors, saves money for individuals and for the healthcare system. In areas of the country where there are more primary care doctors per person, people are less likely to be hospitalized and death rates for cancer, heart disease, and stroke are lower. This was also proven by a study in Rhode Island that showed that a 23% increase in primary care spending resulted in an 18% reduction in overall healthcare spending. A primary care-based system costs less because patients experience better access, fewer hospitalizations, less duplication and more coordinated care. Finding a family doctor for your family’s medical needs could save you and your country money, and more importantly, improve the health of your family. When should a woman see a Family Doctor vs a Gynecologist? ​With all your options for health care, figuring out which doctor to see for your issues can be overwhelming and confusing. Let’s take a look at a couple different types of physicians to help determine which health care provider you should see for gynecological care. Family Physicians often get the question, “What are the differences between the care provided by a gynecologist versus care from a family medicine doctor?” So, what’s the answer? Continue reading to learn some of the differences between the two specialties. Currently, it is recommended that patients begin Pap smear screenings at the age of 21. All female patients should begin at this age, regardless of birth control needs or sexual activity. For further guidance, contact Dr. Jamie Glover at Glover Family Medicine for any health concerns or questions you may have.